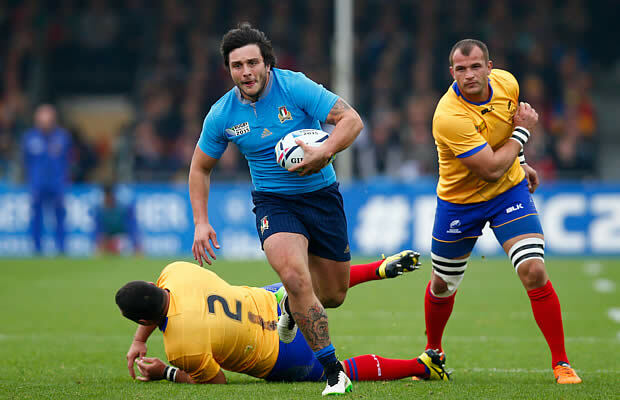 Italy survived a second half comeback from Romania to win their final 2015 Rugby World cup Pool match 32-22 at Sandy Park, Exeter on Sunday. Italy went out to a 22-3 by half time but lost momentum in the second half as Romania outscored the Italian side by 19 points to 10. Italian fly-half Tommaso Allan brought up a century of Test points as Italy secured the crucial third spot in World Cup Pool D which earns them qualification for the 2019 World Cup. The 22-year-old — who opted for the land of his mother’s birth rather than for Scotland where his father comes from — scored a try and kicked 12 points to secure the injury-depleted Italians their place at the 2019 World Cup. The victory means Italy’s French coach Jacques Brunel departs on a winning note after 45 tests in charge. But he failed to rectify the Italians sad record of being the only Tier One side never to reach the knockout stages of the tournament. Florin Vlaicu, Romania’s record Test points scorer, put them ahead in the fifth minute with a long range penalty. Italy scrum-half Edoardo Gori went close to putting the Italians ahead a minute later but he knocked on as he went to touch the ball down from his chip ahead. However, Italy made no mistake in the eighth minute as the impressive Michele Campagnaro — playing on his new club Exeter’s home ground — broke a tackle and floated out a pass to Leonardo Sarto who ran in unopposed. Allan missed the conversion to leave the Italians 5-3 up — and they went a man up in the 16th minute as Romania’s South African-born lock Johannes van Heerden was sin-binned for lashing out at Gori. The livewire scrum-half — picked out by Parisse as one of the players capable of leading the team in the future — made no mistake with the second try-scoring opportunity he was presented with and Allan converted for 15-3. The hulking van Heerden returned. Before taking his place in the lineout, referee Romain Poite held out his hand and they shook hands exchnging pleasantries with the lock patting the Frenchman on the back in a nice touch. The Romanians enjoyed a 10 minute spell inside the Italian five metres area. But hard as they knocked, the Italian line held firm and they eventually forced their opponents into conceding a penalty allowing them to clear their lines. The Italians landed what appeared to be the killer blow shortly before the break with a well worked move. Captain Quintin Geldenhuys offloaded to Gori who passed to Allan. 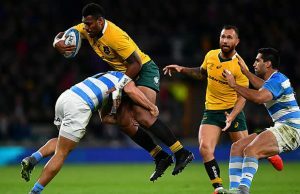 The fly-half broke through the Romanian line and outstripped fullback Catalin Fercu to touch down, wagging his finger and sticking his tongue out in celebration. He added the extras for a half-time lead of 22-3. The Italians rubbed salt in the wound when they added another try in the 47th minute. 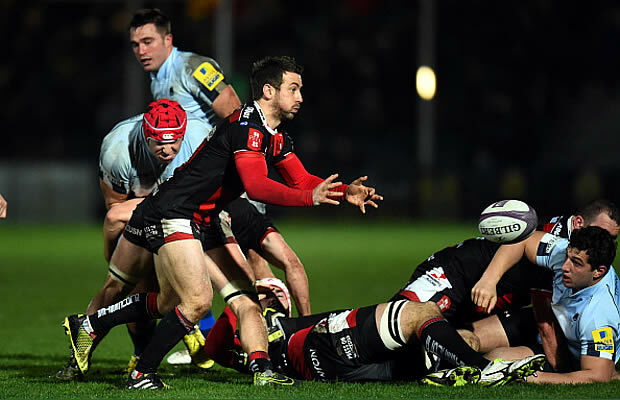 Alessandro Zanni burrowed over and Allan added the conversion for 29-3 and bring up his century. Romania got a deserved try with 15 minutes remaining Adrian Apostol touching down — Vlaicu added the conversion for 29-10. Boos rang out when Italy opted to go for a pop at goal than for touch but Allan paid them no heed to add the three points for 32-10. The Romanians added a third try in the final minutes. Valentin Poparlan raised his arms in celebration after touching down and Vlaicu added the conversion for 32-17. The Romanians finished strongly as Vlaicu’s long floated pass found Apostol who went in in the far left hand corner.